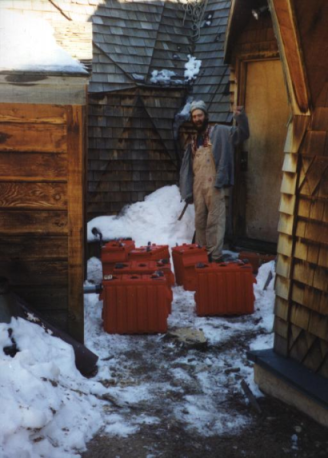 All purely off grid systems have one thing in common, batteries. Batteries is where you have the power to use electrical devices at night, or after prolonged periods of bad weather. Some systems, like water pumping and in some cases refridgeration, can run PV Direct, where the panels directly power the device without batteries. This doesn't work for sources that aer used at night. Currently, there are four main sources for power available to the average person. These are hydro, wind, sun, generator. Fuel cells are still unattainable to the average person in any size big enough to replace a generator. Hydro requires a water source with enough drop or enough flow to turn the blades of a generator. A small flow can work with enough drop. I've seen water runs of over a mile sometimes to get enough drop to produce electricity. In our area there are no large enough sources of water. Our Wetlands doesn't have much flow except for a few weeks in the spring, and the bigger creeks, which are too far away to use anyway, freeze pretty solid for over 6 months a year. But if you have it, hydro is the best source for electricity in large volumnes. The downside is if the water goes down. I was visiting at the Breitenbush community last year, and they run multiple houses off of a centralized power system. Because of a drought in Oregon, they didn't have enough electricity, and were running as diesal backup generator 24/7 to keep up. Sun is a good source of power depending on where you live. To be practical, you need at least 3 hours of clear sun a day on average per week. You can mix sun with other sources for a balanced power system. The advantages to sun power are low maintainance. Once installed, there is nothing to do for about 25 years. No moving parts, and other than the glass, nothing to break. And if breaking the glass is a worry, you can buy unbreakable panels. 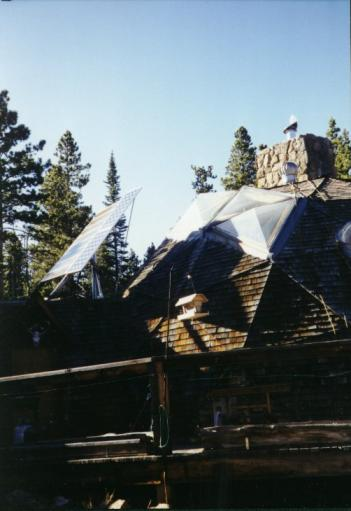 To support photovoltaic panels you'll need some roof space, or you'll need to mount a pole. Pole mounted photovoltaic arrays for any reasonably sized house over 20 feet tall aren't practical, but are possible. On average for a roof mounted installation, think something like 20 x 20 feet square. And it has to be south facing, with the possibility of mounting panels at rougly 40-60 degress. Wind is another source that depends on location. Some areas get constant, or at the best frequent winds. Other areas, like where I live, the long cloudy and stormy periods are usually really windy. So when we're not getting any juice from the photovoltaic panels, the wind kicks in to cover the loss. 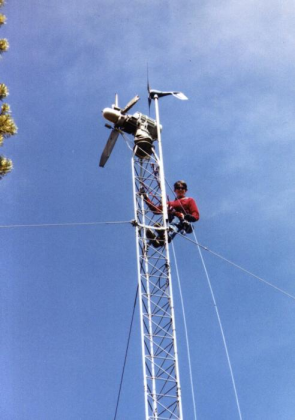 Wind requires a tower, which can be a pole or a triangular tower. On average, getting 20 feet or more above the tree tops is a good thing. Near the tops of the trees there is more turbulance, which wind generators don't like. One downside with wind is unlike photovoltaics, you just can't turn it off if your batteries are fully charged (like a windy and sunny day). So you need a diversion load to reroute the electricity from the wind generator to something like a water or space heator. I hate generators. They burn fuel, so they force me into being a consumer for the energy monopoly. They also break, and are noisy and smelly. Long term power production by using generators is expensive, and probably only worth it for small villages that need huge amounts of power. A town near me, Nederland, has recently installed a large 50 Mega Watt wood burning generator, which burns the slash generated from forest fire mitigation projects in the National Forests near here. That was a good idea. But a generator can also be backup power to charge batteries after a long cloudy strech of weather, or used to run occasional heavy loads like we do to pump water from the well into the cistern once a month or so. A fuel cell is a generator, because it consumes fuel. Many people incorrectly consider a fuel cell a battery. Fuel cells do not store electricity, they make it. Some day a cheap fuel cell that runs the entire house on an inexpensive renewable fuel (hydrogen takes too much power to produce) will be built. Until then, fuel cells are just too expensive to compete with wind and solar. Inverters convert DC as stored in your battery bank into AC, so you can run your computer, stereo, or other AC device. Although inverters aren't 100% efficient, they are efficient enough that some people just run only AC devices like my houses. There are two kinds of inverters, modified sine wave, or true sine-wave. All of the cheap 300 watts inverters you see for cars at truck stops are modified sine wave. A modified sine wave is a squared off and digitally sampled version of a sine wave. A true sine wave is identical to AC power. Some devices don't like the modified sine wave (like stereos or computers), so a true sine wave inverter is recommended. Even if you have an inverter, it makes sense to use as many DC devices, rather than their AC equivalants for the higher efficiency. Most modern inverters have an idle mode, and an active on mode. On my Trace 4024, this is 16 watts. DC lights work just fine, but unless you have an AC lightbulb that pulls more than 16 watts (many compact flourescents are small than this), the lights will blink. Washers, and other devices that drop below 16 watts occaionally will find them selves with no power at all. One solution is to turn on a light while the washer is running, but you get the idea. DC devices are more efficient and less hassle. Especially if your inverter ever blows out, like happened to me, having most everything DC can be very useful. I have neighbors whose off-grid houses are purely DC. These are tyically do it yourself types, and their cabins are wired like a car, car batteries, using dome lights, car stereos, etc... The main advantage of these systems is very low cost, and maintainability. I even know of a few folks that have no power generation capability at all, they just charge spare batteries in their vehicles when they make supply runs to the nearest town. Batteries are a critical part for any off-grid power system. Car batteries just don't cut it... they're designed for an entirely different purpose. If you need to go cheap, golf cart or deep cycle marine batteries will work. The long-time standard for many off-grid houses for a long time were Trojan L16s. These are about 350AH, and have a lifespan of about 6-8 years. When I bought my domes, they had been running on a set of 12 L16s for about 7 years. When it came time to replace them, I decided to go with more long lasting batteries so I wouldn't have to do this again in 7-8 years. I went with Surette (Rolls) Batteries this time, even though the ones I bought were 325lbs monsters. My friend Greg helps unload batteries in the snow. Some of the biggest loads in a house can also be run PV direct. This is commonly used to pump water into a cistern for a few hours a day. The advantages of running a water pump directly off the photovoltaics panels is the pump can be powered when it is too far from the battery bank. There are also refridgerators and freezers that can run PV direct. With a grid intertie system one commonly has no batteries. All produced power flows back into the grid, and you also pay for the difference every month between your power consumption and your power production. It is also possible to build a grid-intertie system with batteries for a backup. The only problem with this approach is that very few inverters are UAL certified to be hooked to the grid, as well as to work with a bank of batteries.